If you want to visit a great Italian city with a more relaxed atmosphere, travel to Palermo, Sicily. Perfect Mediterranean weather, idyllic landscapes, stunning architecture and a vibrant arts scene all make Palermo a popular European tourist destination. 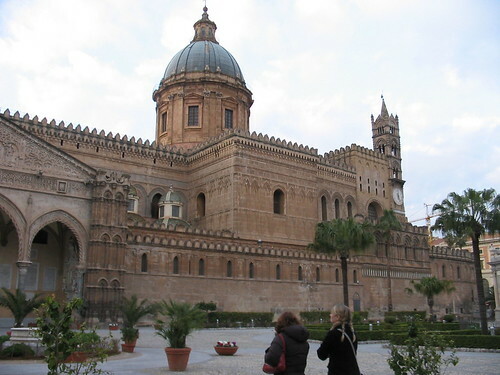 Palermo is known for its many beautiful, old churches that include the Palermo Cathedral. Built in 1185, this stunning church is well worth a visit to see its mixture of architectural styles, elaborate interior of mosaics, precious stones and art works of bronze, silver and marble. One of the church’s most significant features is a 17th century solar observatory that once measured the time and calendar. You can also tour the crypt, which houses the tombs of several historic figures and artists, as well as the Cathedral Treasury to see valuables like holy vestments, goblets and chalices. Unique to Sicily, the gorgeous marble architecture of the church of the Gesu makes it another important church in Palermo while the Cathedral of Monreale is an outstanding Norman monument. Although not suggested for the faint of heart, the Catacombs of the Capuchin rank as one of the city’s more popular attractions. This crypt complex houses the mummified remains of more than 8,000 former Palermo residents, many of which remain well-preserved. One of Italy’s most beautiful palaces, the Palazzo dei Normanni is noted for its Palatine Chapel, which houses the former Royal Apartments of the Norman Sicilian kings. The magnificent mosaics here are regarded as some of the most beautiful in the world. A must-do in Palermo is a visit to the historic Ballaro Market. Located nearby main attractions and hotel accommodation, this lively street market still bears damage from WWII. However, this market is a great place to experience the local culture of Palermo and to haggle for a bargain on fresh foods like swordfish, homemade breads, cheese, vegetables and fruits. Like many Italian cities, Palermo presents a vibrant arts and culture scene. The Gallery of Art for the Sicilian Region showcases an impressive collection of fine arts that range from paintings to frescoes, wooden works and sculptures while the Modern Art Gallery displays many contemporary works. At the Regional Archaeological Museum Antonio Salinas, you can view numerous artifacts from ancient civilizations like Roman, Carthaginian, Hellenistic and Etruscan. If you want to enjoy a live performance, the Teatro Massimo is a must-do. Opened in 1897, this historic opera house often hosted many members of royalty and government heads from all over the world. Today, the restored theater is one of the largest in Europe and boasts excellent acoustics. Palermo is not just about architecture and arts. The city also offers natural attractions that you can experience through scenic drives and hiking. Monte Pellegrino is a nature reserve featuring rocky mountains, flora and fauna and interesting caves that bear prehistoric drawings of elephants and hippopotamuses. Many tourists enjoy scenic drives up to Monte Pellegrino where they can see stunning views of the city and mountains as well as visit the Santa Rosalie Shrine. Offering fabulous views of Mount Etna, Capo Gallo is another nature reserve covering 600 acres of beautiful landscapes and hiking trails. One of Europe’s warmest cities, Palermo features a Mediterranean climate with hot, dry summers and mild, wet winters. No matter what your budget or preferences, Palermo is sure to offer you suitable hotel accommodation. You can find great deals available online today.